WALHALLA, S.C. (CNS) — For a century, a simple but serenely beautiful wooden building tucked away in the picturesque mountain town of Walhalla has been the spiritual home for Catholics. St. Francis of Assisi Mission was built by parishioners who donated their time, money, hours of sweat and labor, and even the wood, so they could have their own church. Today, the mission is home to a small but strong congregation who love and care for each other and treasure the little building passed down to them by that early group of dedicated people. On May 13, current and former members packed the small church nearly to overflowing for a 100th anniversary celebration. 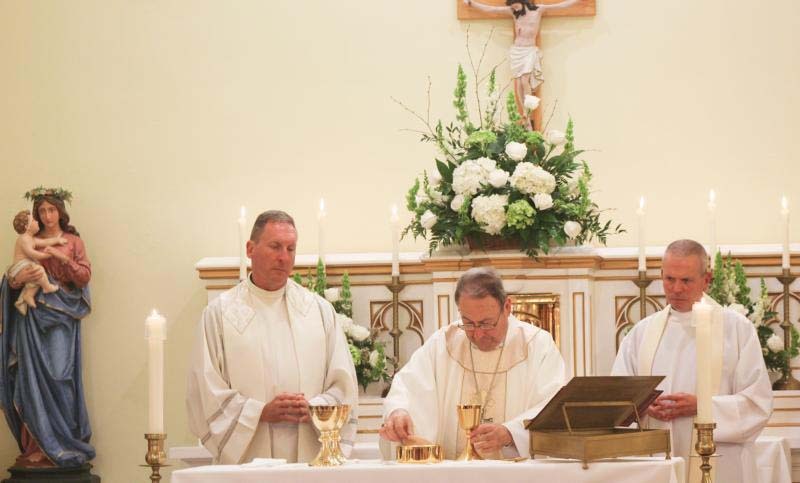 Bishop Robert E. Guglielmone of Charleston celebrated Mass followed by a joyful reception in the parish hall. The bishop congratulated the members of St. Francis on their close-knit community. “People come to an understanding of who Jesus is through seeing others who live a Christian life well-lived, and for 100 years people here at St. Francis have been doing precisely that,” he said. Catholics were few and far-flung in this corner of the state in the early 19th century. Their numbers increased when 600 Irish Catholics moved to the area to work on the proposed Blue Ridge Railroad in the 1850s. The project was an ill-fated attempt to connect South Carolina with Tennessee for trade, and called for tunnels to go through several mountains in the area, including Stumphouse Mountain near Walhalla. The Irish worked on what became known as the Stumphouse Tunnel, and a small town called Tunnel Hill sprang up near the construction site. It had its own church, St. Patrick, which was served by itinerant priests, and for a while had the largest Catholic congregation in the northwest part of the state, according to a published history. Funding for the railroad dried up and the tunnel was abandoned. The town of Tunnel Hill slowly died away and with it St. Patrick Church, which was partially destroyed by fire, then damaged by storms. It is said that the wood of the church was scavenged for firewood by homeless Civil War deserters. All that remains of the church and the town is a cemetery northwest of Walhalla. Many of the descendants of those Irish workers remained in Walhalla and surrounding areas of Oconee County and still needed a place to worship. In 1916, construction began on the church building on East Mauldin Street, on land purchased from Rosa Fahnstock by Bishop Henry P. Northrop. Parishioners used lumber from their farms for the building. It was completed in 1916 and officially dedicated as a mission on May 13, 1917, by Bishop William T. Russell. St. Francis was originally a mission of St. Joseph Church in Anderson, then St. Andrew Church in Clemson, and now is connected to St. Paul the Apostle in Seneca. Diocesan priests served there from 1917 through 1940, and then Paulist priests took the helm from 1940 through 2006. Priests from the diocese returned to the mission in 2006. The current pastor is Father William Hearne. When St. Francis of Assisi was dedicated, there were only 12 Catholic families. By 1940, those numbers had grown to 128 Catholics in Oconee and Pickens counties, including 52 students at what was then Clemson College. Currently, the mission serves about 125 households in a region where the number of faithful continues to grow. At 93, Jenny Grobusky is the oldest member of St. Francis. She is a Walhalla native and became Catholic when she married. She raised her five children at St. Francis of Assisi and has never considered going anywhere else.